You have the power of a complete inventory management system with the AccountMate Inventory Control module. This module provides the ability to define each inventory item’s cost method, units-of-measurement and warehouse and bin locations. You can set each item’s safety stock, lead time, reorder level and reorder quantity. Inventory counts can be performed at any time and as often as needed without interrupting your shipping and receiving processes. You can assign serial numbers to each unit of an inventory item, define multiple substitutes for an item and record transfers of units from one warehouse to another. Stock items can be issued for internal use. You can also view a list of vendors that supply a specific item or a list of items sourced from a particular vendor. 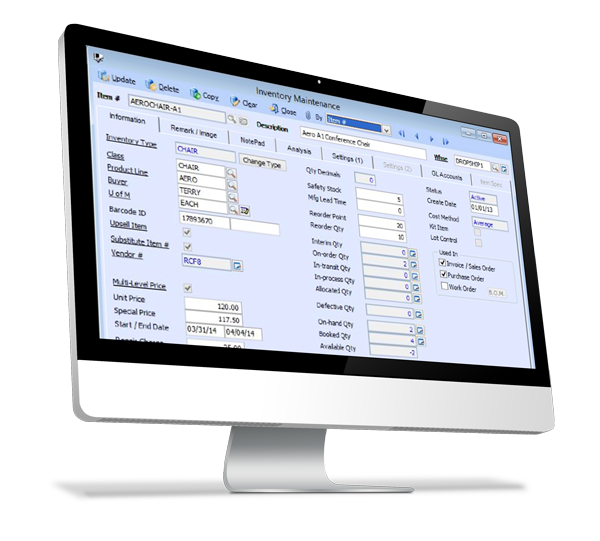 Inventory Control integrates with and enhances the functionalities of the Accounts Receivable, Sales Order, Purchase Order and Manufacturing modules. It also integrates with the Pricing Control, Upsell Management, Inventory Specification, Kitting, Lot Control and Customer Inventory Manager modules.